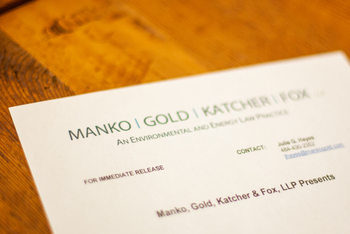 Philadelphia, PA (January 6, 2009) – Brenda Hustis Gotanda, a partner with Manko, Gold, Katcher & Fox, LLP (MGKF), an environmental, energy and land use law firm, will speak on "How Green is Green? Measuring Standards and Practices" at Green Building 101, the Kick Off Meeting of the Sustainability Series: Issues in Sustainable Living and Growth in Radnor Township on Thursday, January 29 from 7 to 9 p.m. The Sustainability Series is co-sponsored by the Radnor Conservancy, the Radnor Environmental Advisory Council and the League of Women Voters of Radnor Township.